You’ll never imagine such a simple recipe could be so satisfying and delicious! 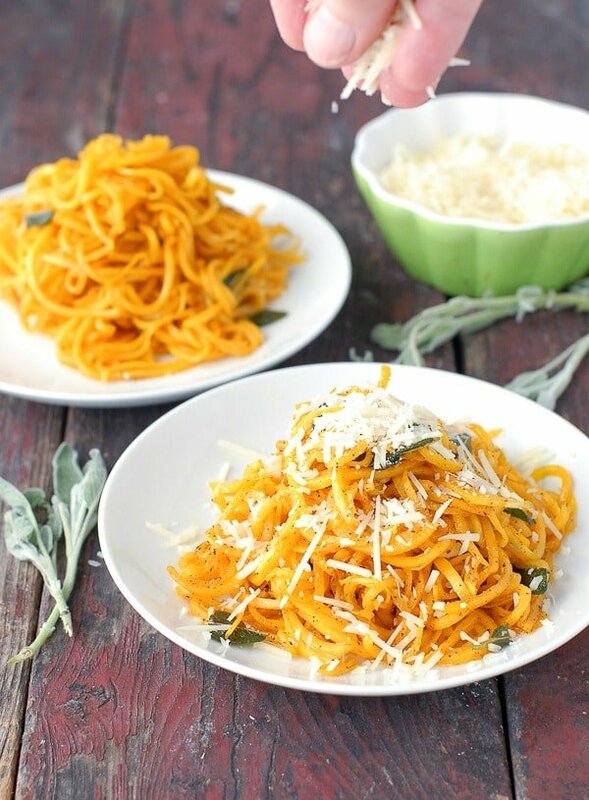 Butternut Squash Noodles in Sage Brown Butter has the texture of pasta and is just as filling! I have been waiting to make this recipe since the summer and am so excited the time has come! 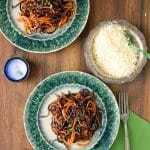 Early in the summer I bought a Spiralizer and it opened up an entirely new world of options for food preparation. If you are unfamiliar with Spiralizers, they are a kitchen gadget which allows turning firm produce into noodles, large spirals and ribbons. My summer highlights were a Cucumber Melon Spa Salad and a Zucchini Ribbon Mediterranean Salad that were delicious. My initial thoughts jumped ahead to transforming winter squash into faux pasta. 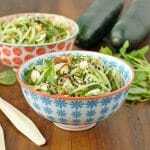 It seems a perfect way to get more vitamin-rich vegetables into the diet and in an unexpected form. 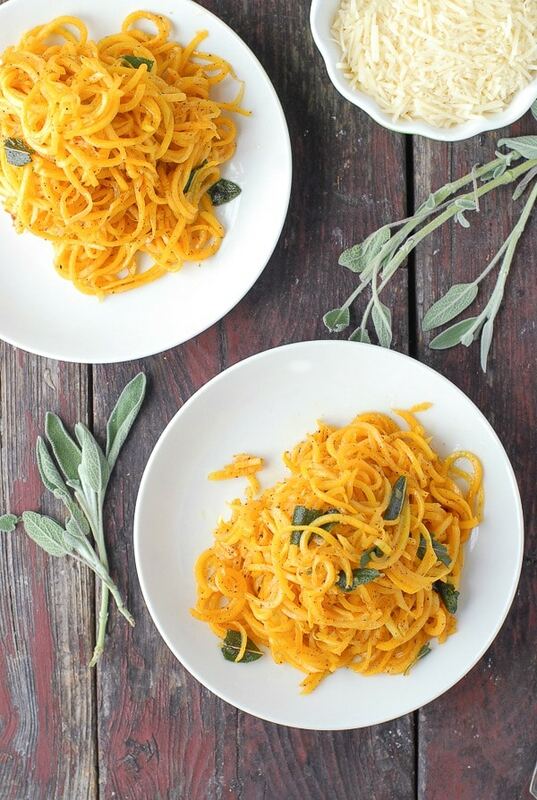 I’ve had in my mind to make Butternut Squash noodles with a simple Sage Brown Butter sauce. It truly is a dish done in less than 30 minutes; who doesn’t love that? Butternut Squash is one of my personal favorite winter squashes. It has a beautiful flavor which is complimented by many different flavors. In addition to having sublimely-hued flesh, Butternut Squash is packed with nutrients, antioxidants, fiber and is particularly rich in Vitamin B6, potassium and beta-carotene. I personally love the flavor and find it very adaptable, more so than some of its sister squashes that stand their ground in the taste department. I’ll confess, I found winter squash loathsome as a child. It was not served in our household often and it seemed every time I had it, it had been prepared to amplify its already earthy sweetness. Acorn squash with brown sugar and maple syrup kind of stuff; sometimes some mini marshmallows thrown in for good measure. I really could not take it; it was just too sweet. As an adult I latched on to Butternut Squash like there was no tomorrow as it did not provide the densely sweet flavors when cooked. And I always prepare it in a savory manner and find it adds beautiful flavors to almost any dish. 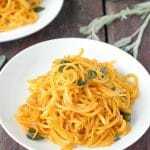 Butternut squash is great for spiralizing. It produces firm noodles which can be roasted and added to most any sauce as one would prepare pasta. My first inclination was to steam it which I will try next. It roasts in about 5-7 minutes and once combined with a sauce is ready within 10 minutes. To spiralize Butternut Squash: Trim the stem from the top of the squash and cut the squash below the neck and before the bulbous bottom area. There should be no seeds in the portion being spiralized. Peel the outside with a vegetable peeler. 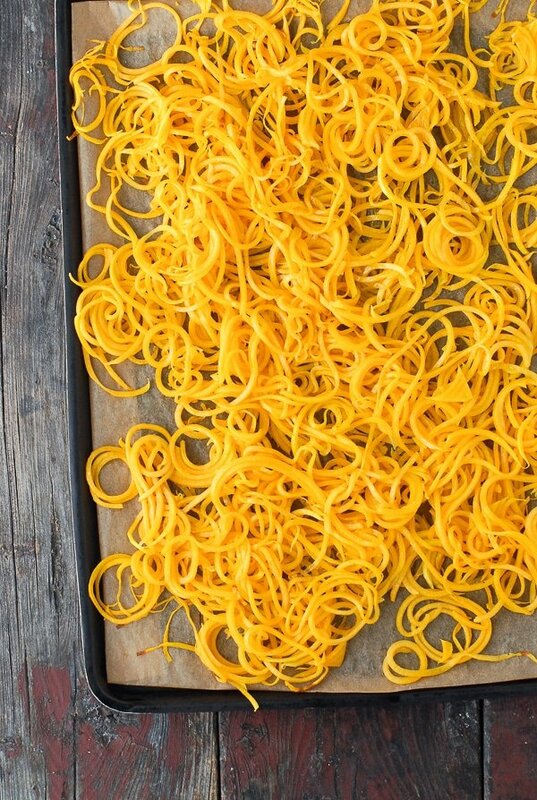 Cut the prepared squash into quarters (or halves depending on the diameter of the squash), insert into the Spiralizer with the small noodle blade and spiralize! 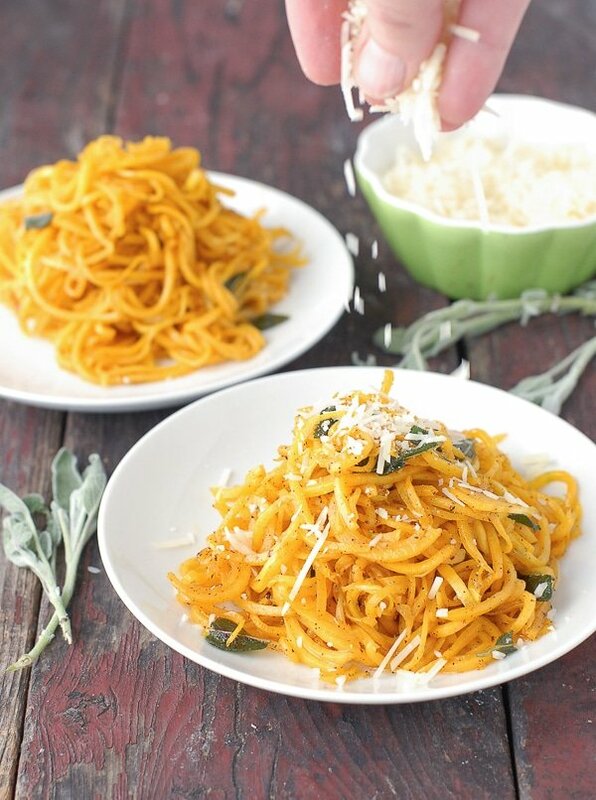 You’ll never miss grain pasta after making this Butternut Squash Noodle in Sage Brown Butter recipe! 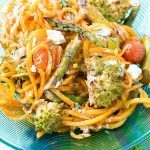 Easy to make with a Spiralizer and quick to prepare too. I do love butternut squash and wish I could try every recipe you have. Hi Jeri. I’m sorry this is difficult for you but completely understand. They can be very difficult to cut open. I don’t have any special tips but did a quick online search and found this article. Also I definitely would suggest using a large, heavy, very sharp knife. I think the sharper the knife, the more work IT will do instead of you. I also searched to see if I could find any unique peelers that might the job easier and found this article. It provides some details than might be worth reviewing? I hope this helps! 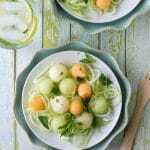 It is very easy to make but delicious and healthy . It is the ideal food for all. thank you to share a easy recipe. I’m really inspired to make for my family. Really enjoyed and also thank you for sharing the recipe. I made this as a side for our family dinner tonight. The flavors were great. The only change I would make is to let the BN noodles cook a little longer in the oven. My oven may not be as hot as yours but mine turned out still a little on the crunchy side. Next time I will cook for 10-15 minutes and then toss immediately with the butter/sage sauce and I think it will be amazing. Thanks for the recipe! Great note Bobbie! Thanks you for taking time to leave your comment! It’s a great reminder that everyone’s oven is slightly different as well as personal preference for doneness. So glad you liked the recipe! I can see why you’re in love with this tool. These noodles have my mouth watering! I made this for dinner tonight and added mild Italian sausage to it. Amaaazing! Fantastic! Definitely would be easy to add meat to it and I bet the flavor was great. Thanks for letting me know Julia; so happy you liked it! This recipe looks delicious. I love this flavor combination. Thank you Marci. I’ll confess I can’t make it when my family is not around or I’d eat the entire recipe. It’s really delish! This is totally up my alley! Loving this recipe, already pinned! 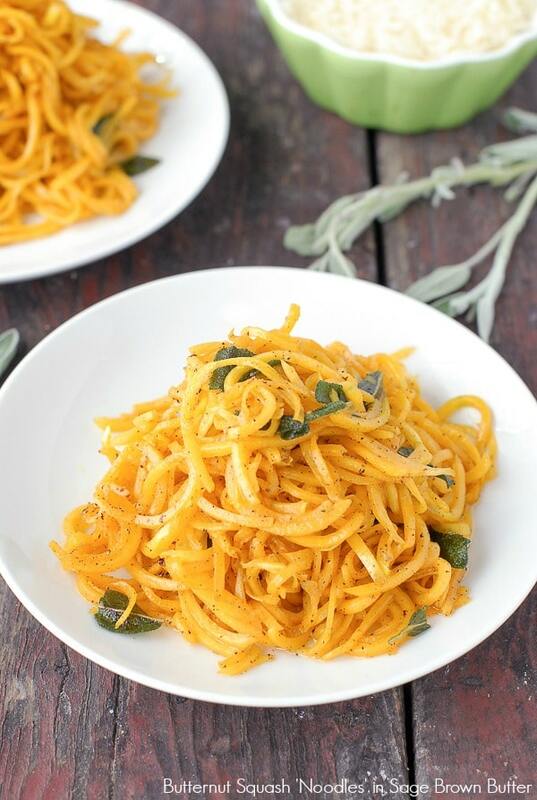 Definitely such a good idea to make “noodles” from butternut squash.. I must try out the recipe. Thanks for sharing it! OMG, I just saw this on triberr, and LOVE it! I’ve been wanting to get a spiralizer for awhile now, but kept wondering if I really needed another kitchen gadget. This recipe answers back “YES”!!! I’ve got to make this!!! 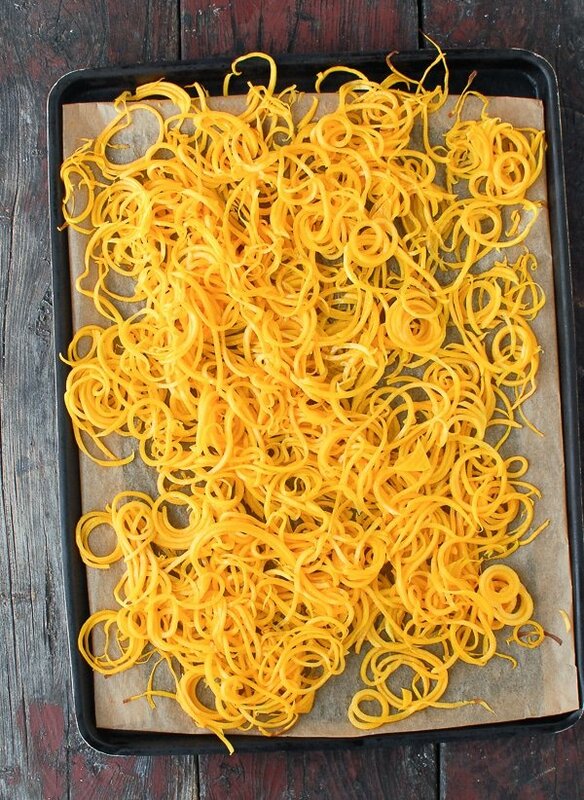 Love love love sage butter, can’t wait to make these noodles. Such a perfect fall dish! Looks amazing girl! Thank you Krista! They are delish and so easy to make!